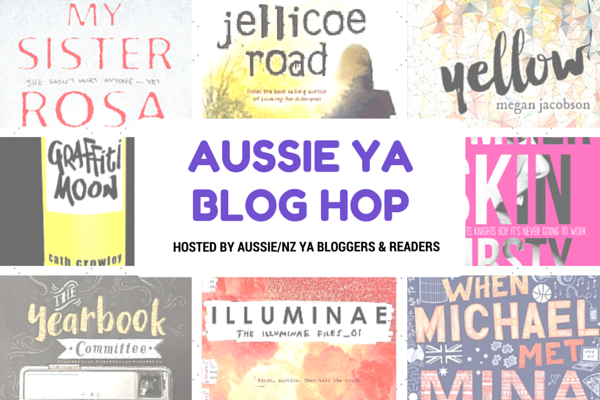 Welcome to the Aussie YA Blog Hop that has been making its rounds across various Australian book bloggers. This blog hop is courtesy of Jeann from Happy Indulgence and I am super excited to share with you guys my thoughts on Aussie YA, what to check out and why I think it's important. There will be a Twitter Chat at the end of the week, so hashtag #AusYABlogChat and join us at @AusYABloggers for some fun! The fact that it's from Australia, written by Australians makes me super proud to talk about Aussie YA. I find that the YA space is predominately dominated by US releases, with very much the same tropes, characters and messages that it really only gives a singular perspective to the Western world. With Aussie YA, I've found somewhat great representations of Australia and it's exciting to have other readers really understand Australians and our views and values. I would have to say Maureen McCarthy was one my favourite authors growing up - I read almost all her books. Otherwise, Melina Marchetta and Lili Wilkinson are great authors to check out as well! Ahh, this is too hard to answer. I read so many! I think the one that stuck with me the most is Scatterheart by Lili Wilkinson. To this day it's still one of my top five reads! Do you guys have any suggestions? I'm terrible at keeping up with any debuting authors. I pretty much assume that anyone who releases a novel is a longstanding author already in the industry. I know, I'm hopeless. If you're looking for a series to read, I loved Magic or Madness by Justine Larbalestier as I was growing up as well as This is Shyness by Leanne Hall. I've started the Obernewytn Chronicles by Isobelle Carmody, which I really enjoyed. For some reason I haven't read the rest of the series but I definitely recommend it as well. I think Illuminae was a huge one I didn't expect to fall in love with - I'm not much of a sci-fi reader, but that book is seriously amazing. Finnikin of the Rock was another one that took me by surprise and really made me feel comfortable with fantasy later on. Scatterheart by Lili Wilkinson, Uglies series by Scott Westerfield, Somebody's Crying and Chain of Hearts by Maureen McCarthy. Definitely Gemina by Amie Kaufman and Jay Kristoff, and These Broken Stars by Amie Kaufman and Meagan Spooner. Look at me and my sci-fi list, wow. 10. Favourite Aussie YA Bloggers! Antee at Read At Midnight, Cait at PaperFury (who is hilarious) and Eugenia at Genie In A Book! There are so many other Aussie bloggers to check out, so take a peek at this list to see who else is taking part in this Blog Hop! My pleasure! So glad you started this, was really fun answering these questions :) I'm excited to continue with it, if we read it at the same time we can do a discussion on it!! Awww, *blushes* I'm honoured to be mentioned! YOU ARE TOO KIND. <3 Also omg I love your reason for loving Oz YA and I totally agree!! I love finding an Aussie book and it feels so special, and almost homey somehow?! Plus there really aren't enough out there. I wish they were also more available widely overseas because I neeeed to recommend them to everyone but no one outside of Australia can ever find them! GAH. Such problems. hehe. Anyway. I love the books you mentioned too!! Illuminae = perfection. These Broken Stars = omg so much love. And I really want to read This is Shyness!! I always forget that Scott Westerfeld is an Aussie! The Uglies series is one of my favourites! I definitely recommend Yellow by Megan Jacobson for a 2016 Debut! Kelly from DivaBookNerd is seriously the sweetest! I love her. This is a really fun hop, because I want to read more Aussie fiction. There is a book called John Belushi is Dead and I'm PRETTY sure the author is Australian - I think the book is titled differently there. Anyway, it's fantastic. I highly suggest it!